The Trial of Louis Riel in a little rented storefront in Regina, the newly established capital of the North West Territories, in July and August 1885 remains the most controversial in Canadian history. It has been recognized as a pivotal divisive moment in Canada’s political development. Through the nineteenth and much of the twentieth century Canada’s ‘official’ historians considered the trial closed; the jurisdiction of the court was appropriate, the charge of High Treason (a capital offense) was just and the conduct of the court was correct. Riel was officially executed as he was guilty as charged. Officially Louis Riel was a traitor, unofficially, Riel was, and is, a hero to the Canadian people; a leader who was attacked, charged, tried, condemned and executed as he stood up for justice and democracy. Whereas Riel’s trial with a jury of six, all of whom were “Anglos” was always deemed suspicious, as was conducting the trial in English, especially under a “stipendiary magistrate” who was also a Reserve Officer and council for the Lieutenant Governor and Council there was little real analysis of the process. That was about to change. Through the 1960-70s Aboriginal rights came to the fore in Canada with the Metis and First Nations calling for the restoration of their hereditary rights. Big Bear, Poundmaker, Gabriel Dumont and Louis Riel were all recognized as the Heroes of the Great Northwest. Louis Riel was recognized as the father of the Metis nation and as the nation grew it once again began to change history. The reality of Riel’s trial finally came clear with the publication of the Canadian Lawyer Magazine’s article “The Crown Letters” indicating that the prime minister of Canada, John A. Macdonald, “fitted-up” Riel’s Trial to ensure he would hang. 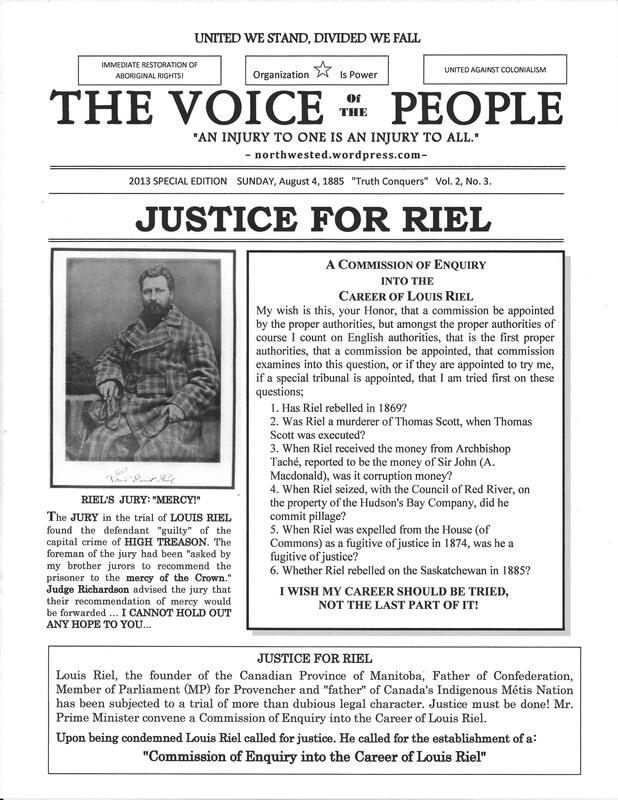 The publication of Metis lawyer George Goulet’s The Trial of Louis Riel, Justice and Mercy Denied has provided a critical legal and political analysis of the trial from a legal point of view and it is shocking to see what an injustice has been perpetrated on the Canadian people, and especially the Metis nation. Upon being found “guilty” Louis Riel called out for a Commission of Enquiry into the Career of Louis Riel. Such a commission is still needed to remove the stain upon Louis Riel’s good name. VOICE OF THE PEOPLE, vol. 2, No. 5.